What a crowd today! What happens when thousands of school-age children come together in one stadium to see the Dalai Lama? You get an excitement and energy like none other! Today the Key Arena in Seattle was filled with children bussed in from all around the Seattle area. It was hard to even get into the media entrance with so many chattering and excited children and teachers waiting in masses outside! I'm sure much of the fun for everyone there was getting out of the classroom on a Monday! Inside the stadium was teeming with a buzzing of voices, laughter, shouting and noise. During the event, children were cheering from their seats, clapping after every presentation and deafened the stadium when the 7th grade international children's ambassador went onto the stage and spoke to the crowd. Perhaps this is what happens when you get a bunch of children together: fun! 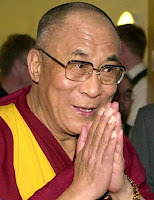 Is it as the Dalai Lama says: children are simply more honest about what is in their hearts. What was most inspiring about having the Dalai Lama here in Seattle was the permission he gave us to be open, fragile, vulnerable and, yes, compassionate. I do believe we need to give ourselves permission to experience what it feels like to be compassionate - to allow our hearts to fill with love (rather than cynicism), to fill with joy (rather than fear), to fill with forgiveness (rather than competition). We have to make a conscious effort to push away everything which tells us that financial success and economic accomplishment the most important. It can be extremely hard to consider that those statements are actually off track - I feel the pull of it every day around me! What happened to allowing ourselves to be human? Perhaps when we allow ourselves to be full human beings (wise, fragile, intelligent, insecure, alive) we will automatically remember what compassion is all about? I'm not sure but I sometimes believe that when I let down my guard and throw off all of the weights of society pushing me down that I am instantly able to be compassionate again (and in turn to be a better member of society). Sometimes I think it is so easy: just let go and let myself fall into the direction my soul is taking me. I have a bunch of photos but haven't yet got around to sorting through them. I'm not sure how to present them: Should I do a photo blog or just add them back into the previous blogs. ?I'll have to think about how to best go about it. Until then I'll leave everyone with the link to today's amazing event: www.seedsofcompassion.net/webcast/index.html (go to the Children & Youth Day event). Kind thoughts to every one of you out there!